How to retouch photos. 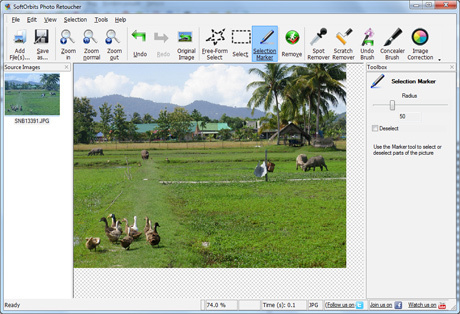 Software to retouch your photo. "How to retouch my photos?" is not the questions that professional or advanced amateur photographers ask. But, "How to retouch photos quickly and easily?" is exactly what they want to know! Professional retouching software, like Adobe Photoshop and the like is, no doubt, highly efficient but very difficult to use. Use Spot Remover tool to remove spots and other skin defects from the selected area, don’t forget to check the "Apply to selection only" check box! Save the photo when you are happy with the results. Supported target formats include BMP, GIF, JPEG, PNG, MNG, ICO, TIFF, TGA, PCX, WBMP, JP2, JPC, PGX, RAS, PNM and SKA. Download Photo Retoucher now to see how it works!